It is no secret that the Boston Bruins rely heavily on their top line to provide the majority of their scoring chances. So, when David Pastrnak wound up on injured reserve in February after undergoing surgery for a thumb injury he sustained after falling while leaving a team dinner, there was concern over who would be able to fill the gap. At the time, the Bruins were sitting in third place in the Atlantic Division, and were just one point ahead of the Montreal Canadiens. It would prove to be a turning point for the Bruins, but not in the way that most people would have expected. Rather than struggling to score without Pastrnak, the Bruins put together a streak of19 consecutive games where they recorded at least one point. Pastrnak has shown no signs of rust since returning to the lineup on Mar. 19. In nine games since his return, the 22-year-old has been all over the scoresheet, recording 13 points during that span, including a five-point nightagainst the New York Rangers. With Pastrnak back and seemingly healthy, he will likely be a huge part of the Bruins’ success this postseason. The Bruins will face the Toronto Maple Leafs in the first round of the Stanley Cup Playoffs, a rematch of their series from last season in which Boston defeated Toronto in seven games. A large part of the Bruins’ success in that series was the outstanding performance from Pastrnak. During Game 2 of that series, Pastrnak exploded for three goals and three assists in a 7-3 win. In total, Pastrnak has 24 points in 18 career playoff games. 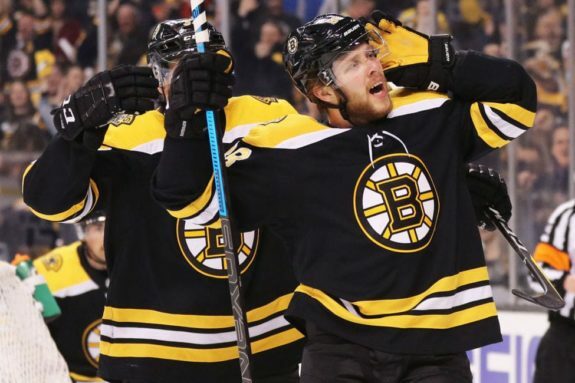 Now about to play in the Stanley Cup Playoffs for the third time in his young career, Pastrnak is expected to lead the offensive attack for the Bruins as they look to eliminate the Maple Leafs for the second consecutive season. With 38 goals during the regular season, Pastrnak is the leader on the Bruins despite only appearing in 65 games. In an 82-game season, that translates to 48 goals, which would have been the most by a Bruin since Cam Neely scored 50 during the 1993-94 season. Pastrnak is building a reputation as one of the best snipers in the NHL, but he will need to continue on that pace for the Bruins to find success this spring. Pastrnak’s injury could actually prove to be a blessing in disguise for the Bruins. They managed to secure home-ice advantage despite missing their star winger for an extended period of time, and now he is rested and healthy in time for the Bruins to begin their quest for the Stanley Cup. Despite how well the top line has performed for the Bruins this season, there is a large number of fans who believe Pastrnak should be moved to the second lineto play with David Krejci and Jake DeBrusk. This is not a case of demoting a player due to poor performance, but rather an opportunity to spread the scoring throughout the lineup. Pastrnak, Bergeron, and Marchand have been the three top scorers for the Bruins this season, but Krejci has quietly enjoyed a very successful season as well. With 71 points this season, he is just shy of his personal best of 73 points set during the 2008-09 season, and he has done it all with a rotating cast of linemates. When Pastrnak was sidelined for several weeks, Marchand and Bergeron were able to continue scoring at an impressive rate while forcing whoever was on that line to step up their play as well. Using Pastrnak on the second line gives the Bruins another dangerous line, and Krejci’s playmaking ability seems to be a perfect match for Pastrnak. 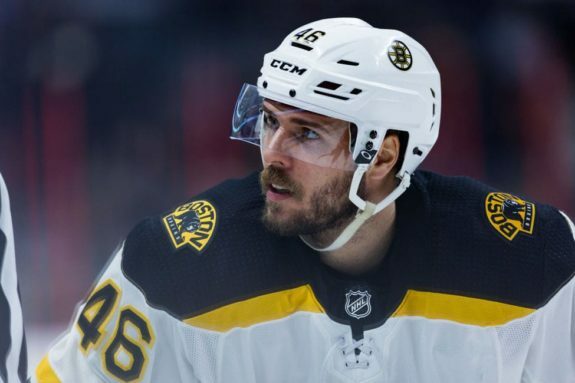 Krejci has seemingly flown under the radar for most of his career, partly due to the other star players that he has been surrounded by during his time with the Bruins. Despite that, he has been one of Boston’s most consistent players, especially during the playoffs. Memories of Boston’s collapse after Krejci was injured during the 2010 Eastern Conference Semifinal series against the Philadelphia Flyers still haunt Bruins fans everywhere. Depth is one of the most important factors to playoff success, and moving Pastrnak around in the lineup creates that for the Bruins. Whether he is playing on the first line with Marchand and Bergeron or on the second alongside fellow Czech native Krejci, Pastrnak is sure to make a big impact for the Bruins during their playoff run.